We have a problem (M.B. Beck). Beginnings of a change of perspective (M.B. Beck). Structural change: A definition (M.B. Beck). Lake Erie and evolving issues of the quality of its water (W.M. Schertzer, D.C.L. Lam). Impacts of acidic atmospheric deposition on the chemical composition of stream water and soil water (G.M. Hornberger). Belief networks: Generating the feared dislocations (O. Varis). Random search and the reachability of target futures (M.B. Beck, J. Chen, O.O. Osidele). Uncertainty and the detection of structural change in models of environmental systems (K.J. Beven). Simplicity out of complexity (P.C. Young, S. Parkinson, M. Lees). Structural effects of landscape and land use in streamflow response (T.S. Kokkonen, A.J. Jakeman). Elasto-plastic deformation of structure (M.B. Beck, J.D. Stigter, D. Lloyd Smith). Detecting and forecasting growth in the seeds of change (J. Chen, M.B. Beck). Parametric change as the agent of control (K.J. Keesman). Identifying the inclination of a system towards a terminal state from current observations (A.V. Kryazhimskii, M.B. Beck). Biosketches of authors. Subject Index. Policy-makers and the public, it has famously been said, are more interested in the possibility of non-linear dislocations and surprises in the behaviour of the environment than in smooth extrapolations of current trends. 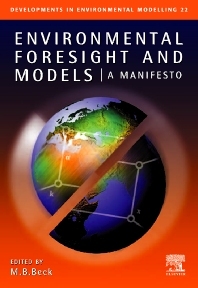 The International Task Force in Forecasting Environmental Change (1993-1998) dedicated its work to developing procedures of model building capable of addressing our palpable concerns for substantial change in the future. This volume discusses the immense challenges that such structural change presents - that the behaviour of the environment may become radically different from that observed in the past - and investigates the potentially profound implications for model development. Drawing upon case histories from the Great Lakes, acidic atmospheric deposition and, among others, the urban ozone problem, this discourse responds to a new agenda of questions. For example: "What system of 'radar' might we design to detect threats to the environment lying just beyond the 'horizon'?" and "Are the seeds of structural change identifiable within the record of the recent past?" Meticulously researched by leading environmental modellers, this milestone volume engages vigorously with its subject and offers an animated account of how models can begin to take into consideration the significant threats and uncertainties posed by structural change.